I have just got home from a lovely walk on the beach. The dune safari people were packing up and once the saddles and blankets were off the camels backs they enjoyed a roll on the sand. It must make them feel itchy having a saddle and blanket on all day. Great shot!! Glad you're up and about and SoH fully restored!! What timing! Very funny expression...haha! Love his open mouth. So expressive ! Such a smile !! but I think he should go to the dentist ha ha !! Great capture Babs, love that expression. Maybe he's wondering where the three wise men have gone?! @ludwigsdiana @30pics4jackiesdiamond It is lovely to be out and about again. I get withdrawal symptoms if I can't get to walk on a beach. @gardenfolk @hermann @dide @fr1da @ziggy77 @annied @beryl @happysnaps I love camels, they always look so superior. @casablanca he is laughing because he is heading for home. @inthecloud5 You would be hard pushed to find three wise men in Australia Christine. ha ha. 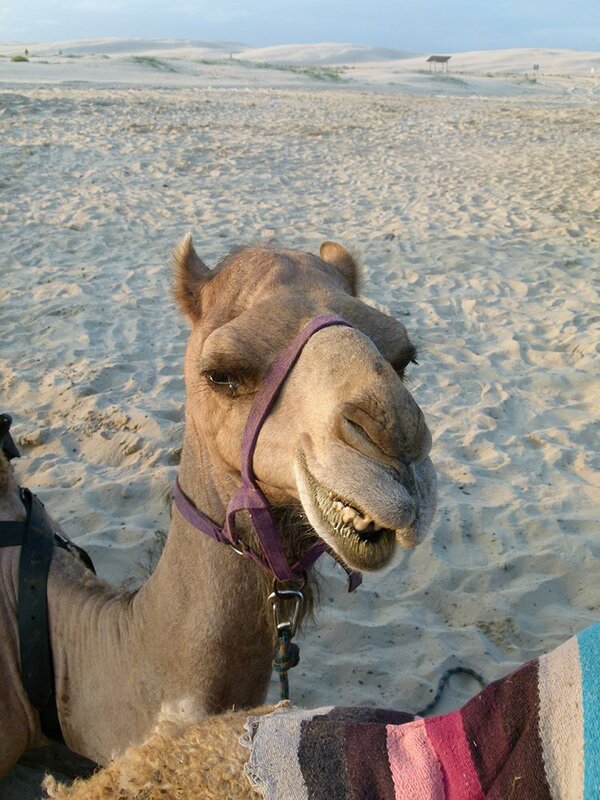 Just the coolest adventure, to ride a camel on the beach! Oh my! He’s a cool fellow! Such a good close up with the dunes in the bsckground. Lovely shot. Still early for him to celebrate the feast of the Three Kings. Yes, the camera was hand held throughout our Valletta evening. I find carrying a tripod very cumbersome. Fantastic shot & looks as if it could be in the desert! So funny. Great pov and timing. This makes me smile! Great shot & a fav..
What a surprise seeing camels in Australia, I know you have them but it always surprises me for some reason! Wonderful photo! Fun shot- he does seem to be a happy fellow! @angelar @louannwarren @jodies @henrir @pdulis @bkbinthecity @seattlite @samae @brennieb @carolmw @moviegal1 @haskar @ingrid01 @featherstone26 @sstcowan @olivetreeann I love camels, they are such characters although they can get quite nasty on occasion. @happypat Apparently according to statistics this year we have over one million feral camels in Australia. They had a cull in 2013 but the numbers have increased dramatically again since then. Camels were introduced to Australia in the 1840s to help explore the interior and also work as pack animals during the building of the railways. @sangwann well done with your hand held photo it was very good. @carole_sandford The dunes are huge and are about 32 km long from Anna Bay to Newcastle. That’s a wonderful shot. I love it. Funny and a beautiful view. great shot and composition. Aww, it looks like he's smiling at you. Very cute shot, Babs.